Center-left parliamentary opposition party Fair Russia has announced plans to gather 10 million signatures for a petition to dismiss Prime Minister Dmitry Medvedev’s government and cancel recently introduced taxes and charges. Pakholkov also told reporters that he blamed personally PM Medvedev for the dire state of the Russian economy, and expected the situation to improve if Medvedev is fired. “The resignation of just one person will put us on the road to recovery. A new person must come who will introduce new, serious optimization measures, new reforms that will give 140 million citizens of the richest country of the world an opportunity to sustain themselves,” he said. 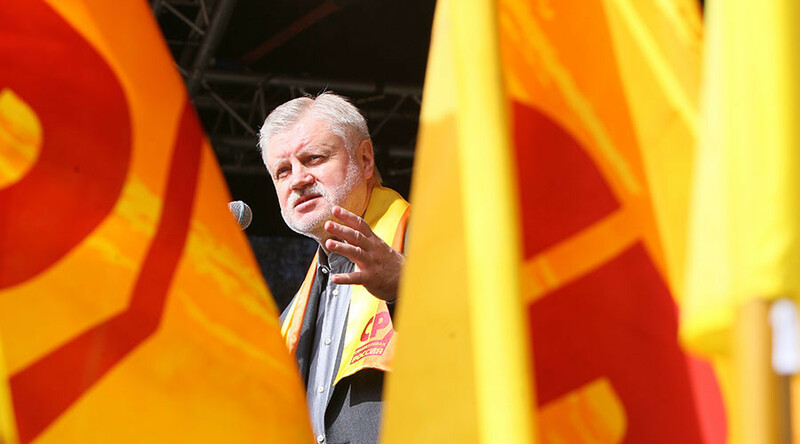 Fair Russia leader Sergey Mironov talked about his party entering the elections race in an extensive interview with the mass circulation daily Izvestia. He said that he had no doubts that Fair Russia would win seats in the State Duma because the party had performed relatively well during the last Single Elections Day in September 2015. Fair Russia came third in those elections, according to the number of lawmakers elected to regional legislatures, outdoing the populist-nationalist party LDPR, but staying behind centrist conservatives United Russia and the Communist Party of the Russian Federation. Mironov also said that the party did not plan to offer parliamentary seats to any famous figures in a bid to boost its popularity. “I have already announced that there will be only one name in the beginning of the election list. I am the leader of the party, I lead the whole team into combat, but when we get our votes, if we get quite a lot of them, I will have only one seat and give the rest to regional party branches,” he told reporters. The politician added that he expected United Russia to lose some of its positions at the forthcoming elections – mostly due to the new system that distributes half of the State Duma seats among party candidates and the other half by candidates from individual constituencies. He also said that under the new system, any attempts to rig the vote were unlikely because the ruling party did not want to give the opposition the smallest excuse to doubt the results of the polls.